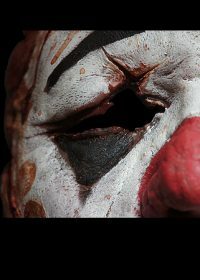 A creepy Silicone Clown Mask Prosthetic featuring a distorted human face with savagely cut edges, complete with ‘pull points’ sculpted in for you to thread through string, twine or ribbon to finish the look. This prosthetic/mask is very easy to apply (no blending edges) and gives a huge effect. 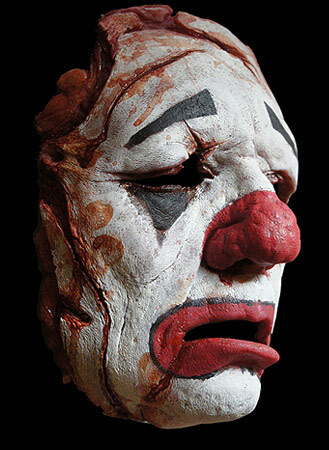 If painted in natural human tones rather than clown makeup, the effect is equally nasty. This premium version of our Severed Clown Face is reusable and with care, can last for years. 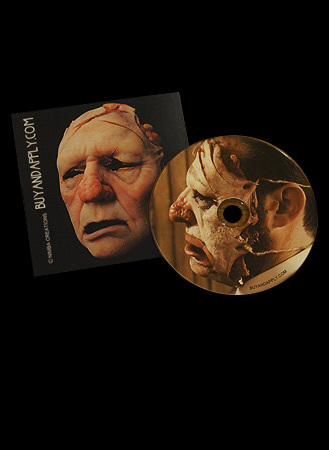 The mask comes unpainted and can be coloured using our Alcohol Activated Palette or Cream Palette which will allow you to refresh the paint job each time you wear it (although touch-ups may be needed if you are wearing the mask for long periods of time). If you prefer a more permanent paint job, use silicone paints to create your desired effect. 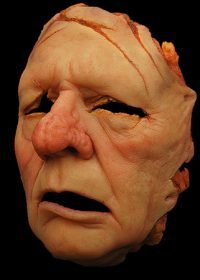 As this is a half mask (doesn’t cover the top of the head) we also recommend using our NimbaFix Silicone Prosthetic Adhesive to help keep the mask in place securely. Comes complete with a FREE tutorial DVD so you can learn how to get a startling finish with this unique mask.